Seemingly one of the most beloved people in Pre-Raphaelite art is Mrs James Hannay, also known as Margaret Thompson. She had been named after her mother, Margaret Ann Henning, who had married her first cousin Joseph Thompson in 1832 and had 8 children. Joseph worked for the Oriental Bank Company and his work involved the family leaving London for Australia in 1853 on the ship 'Madagascar'. Before that, Margaret, the couples eldest daughter had found a reason to stay behind in London. 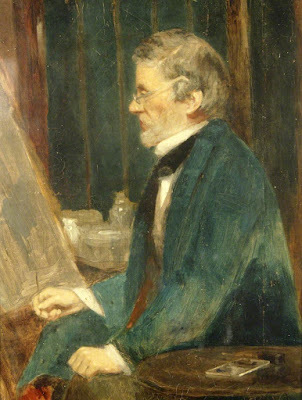 In 1851, whilst visiting her Aunt Agnes, who was married to Punch cartoonist Kenny Meadows, Margaret met James Hannay. 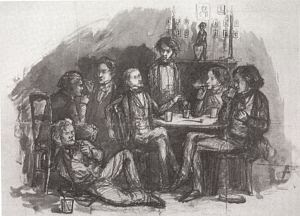 Hannay like Kenny Meadows, had contributed to magazines like Punch but the young man had led a somewhat more bohemian life. 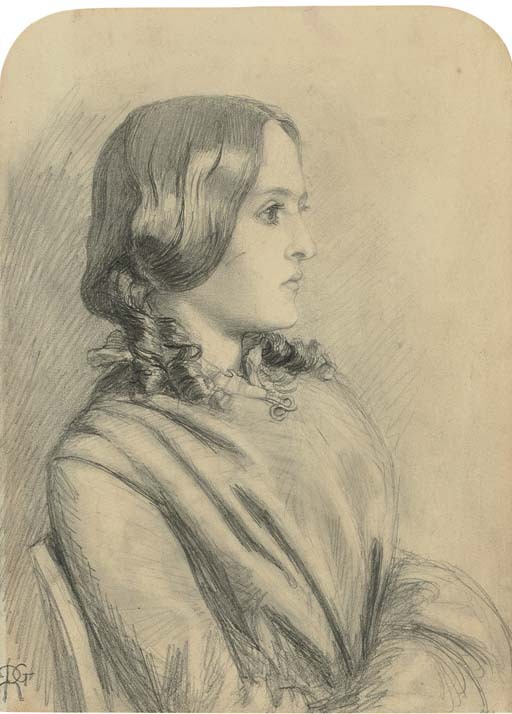 At the same time as James Hannay was writing to his friend William Allingham about the beautiful girl he has just met, Miss Georgiana Lock was pregnant with his son, James Maxwell Lock, who was born at the beginning of 1852. In the October of 1851, Hannay wrote to Allingham after the visit to Meadow's house 'Have you not heard me speak of a niece of his, Margaret? She was there - a sweet grave girl - "Love walks in the pleasant mazes of her hair" as Cowley says. - But not to bore you with all I think of her (shall we have the Honeymoon at Ballyshannon?)' Safe to say that Hannay had fallen head over heels with Margaret, but did not have the money to marry, as he bemoaned 'I could not even raise the wind to blow Hymen's torch!' (although he blew enough on Miss Lock's torch to make James Maxwell Lock pop out). James and Margaret's courtship and engagement was a fairly long one, lasting until 24 February 1853 when they married at the Scotch Church, River Terrace, Islington. This watercolour, painted for Ellen Heaton (see the post on the other Ellen Heaton for who she is), shows Margaret at Beatrice, Annie Miller as the attendant on the right and possibly William Allingham as Dante. I note the painting is from 1856 and it is interesting how much of the figure of Beatrice is obscured because by this time Margaret was almost constantly pregnant. The family lived at Pleasant Row, Islington, within easy reach of the countryside at Highbury, Highgate and Hampstead, where the family enjoyed long walks. Their first child, David was born in 1853, followed by Elizabeth in 1855, Margaret in 1856 and Patrick in 1859. In 1860, the family moved to Edinburgh when James was invited to be editor of Edinburgh Courant. Two more children were born there but James wished to return to London, which the Hannays did after James was invited to write for the Pall Mall Gazette in 1865. That same year, a short illness took Margaret, at only 32 years old, devastating everyone who knew her. Rossetti declared it 'one of the saddest things I ever heard' in a letter to Christina Rossetti (which, considering his life at that point, is saying something). For Hannay, it was the ruin of his happiness. He wrote that losing a beloved wife was 'the most dreadful pain inflicted on mortals by any weapon in the armoury of doom' and he never recovered. He left his children in the care of a family friend, Charlotte Cole, who moved into the family home to care for them. Hannay went to Southend and drank heavily, grappling with overwhelming depression. When the first anniversary of Margaret's death came, he wanted the family to go to him as the thought of returning to the place where she died was too painful and at least in Southend, his memories of her were of being 'well and happy'. I see a lot of Rossetti's story in Hannay and it is an interesting coincidence that both men's wives, both Beatrices, died young, devastating their husbands, but that of course is too easy a coincidence. 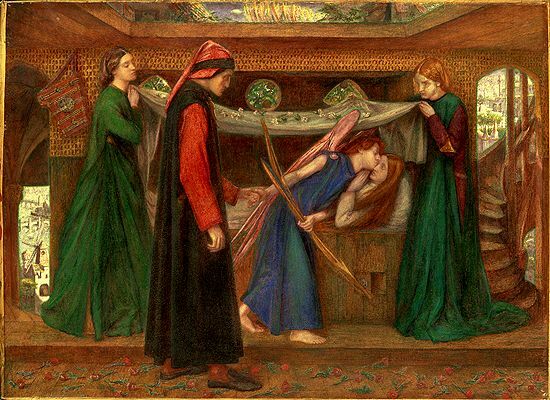 Being an ignorant soul (and not a massive fan of Rossetti's work before Fanny) I always assumed the Beatrice in the watercolour was Elizabeth Siddal, and I think it's telling the way Rossetti talks about Margaret. What is certain is that the loss of Margaret contributed to the early death of James Hannay in 1873 whilst working for the British Consul in Barcelona, leading to the friends of the family to raise money to support the children. What is sure is that Margaret was very much loved by all who knew her. In Australia, her father posted the following in Melbourne's Argus - 'DEATH: On 29th December 1865, at Tavistock, London, Margaret Annie Thompson, wife of James Hannay Esq, and eldest daughter of Joseph Thompson Esq, Oriental Bank Corporation, Melbourne.' The death of the Sugarplum of the Universe had left the world a sadder place.